The Legend of the Apartment Invaded is a short serialized thriller written by Anthony Wilbourne under the pseudonym of Angela Riteman; Floating to the End is an apocalyptic flash fiction story written by Anthony Wilbourne himself. The former, through its narrator and others, tells the legend of a woman who's bullied by an obnoxious neighbor in an inner-city apartment. The latter shows the memories, thoughts and actions of two young adults as they approach their impending doom. The book itself is approximately 3,000 words. The first half of it is part of a bigger yet-to-be-published work entitled "The Book of Lost Urban Legends." The second half is a unconnected (or add-on) story . Subsequent lost urban legends, if published as individual books, will contain other add-on stories . The book's currently available in ebook and audiobook forms although "Floating to the End" has yet to be included in the audiobook . "The Legend of the Apartment Invaded" and "Floating to the End" were rejected by the literary magazines to which Wilbourne submitted them. Clarkesworld and Asimov's told him in a very generic way that the two stories didn't suit their needs. "Floating to the End" was submitted to a third magazine, Daily Science Fiction. According to its editors, they "reviewed many strong stories that we did not take. Either the fit was wrong or we'd just taken tales with a similar theme or any of a half dozen other reasons     ." Like with "The Hungry Man", Wilbourne self-published "The Legend of the Apartment Invaded" as a Kindle ebook in 2016 . He later published "Floating to the End" as an add-on (to the ebook) . Currently, "The Legend of the Apartment Invaded + Floating to the End" holds a 2 out of 5 star average rating on Goodreads . No sales records are available at this time. "The Legend of the Apartment Invaded" uses its narrator, Lisa, to frame the story. By explaining her characters--particularly the main one, Sues--she indirectly exposes her own tastes, prejudices and fears. Through Sues, we learn about Lisa. "Floating to the End" is interlaced with clips from the characters' lives as if flashing before their eyes and events presently surfacing. It isn't revealed until the very end what is actually happening . ↑ 1.0 1.1 1.2 Riteman, Angela, and Anthony R. Wilbourne. The Legend of the Apartment Invaded + Floating to the End. 4th ed., 1613 Productions, 2016. Kindle. ↑ Riteman, Angela. The Legend of the Apartment Invaded. Narrated by Jenny Hammond et al., 1613 Productions, 2016. Audiobook. ↑ Clarke, Neil. "Clarkesworld Magazine Submission [#867932] The Legend of the Apartment Invaded." Received by Anthony Wilbourne, 20 Feb. 2016. ↑ Williams, Sheila. "Asimov's Magazine Submission [#530554] The Legend of the Apartment Invaded." Received by Anthony Wilbourne, 29 Feb. 2016. ↑ Clarke, Neil. "Clarkesworld Magazine Submission [#491580] Floating to the End." Received by Anthony Wilbourne, 7 Dec. 2017. ↑ Williams, Sheila. "Asimov's Magazine Submission [#573184] Floating to the End." Received by Anthony Wilbourne, 14 Feb. 2018. ↑ Jonathan & Michele. "Daily Science Fiction." Received by Anthony Wilbourne, 6 Mar. 2018. ↑ "The Hungry Man (2015) - The 1613 Wiki." The 1613 Wiki, 18 Mar. 2019, http://the1613s.net/wiki/Productions:The_Hungry_Man_(2015). 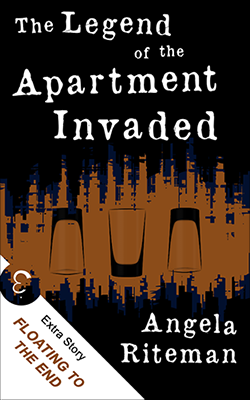 ↑ "The Legend of the Apartment Invaded by Angela Riteman." Goodreads, 18 Mar. 2019, goodreads.com/book/show/29486896-the-legend-of-the-apartment-invaded. ↑ "Amazon.com: The Legend of the Apartment Invaded + Floating to the End (The Book of Lost Urban Legends 1) eBook: Angela Riteman, Anthony R. Wilbourne, Anthony Wilbourne: Kindle Store." Amazon, 18 Mar. 2019, amazon.com/dp/B01CH6QJ4A. ↑ "Witch's Brew (2011) - Full Cast & Crew - IMDb." 18 Mar. 2019, imdb.com/title/tt1766203/fullcredits. ↑ "Corporations - WA Secretary of State." 18 Mar. 2019, sos.wa.gov/corps. ↑ "1613 Enterprises - Fill the Void." 18 Mar. 2019, the1613s.net. This page was last modified on 24 March 2019, at 15:17.